Updated edition of earlier best-selling book. 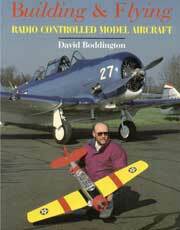 Book deals with the types of models and radio systems available, the materials and tools required for the building and installation, and the basics of learning to fly the aircraft. Covers modelling of aeroplanes, helicopters, sailplanes, seaplanes, autogyros and general sport flying. 240 pgs, SB, 7.5 x 9.5, 100s of photos, illustrations and diagrams.